From left: Leona Barnes, Ruth Hammett, Gladys Butler and Bernice Underwood at Washington, DC’s Zion Baptist Church. The centenarians will be attending their 100th birthday celebration there in June. As they prepare to celebrate the amazing accomplishment of turning 100 years old, four lifelong friends sat down to share the wisdom they’ve gained over the last century. It’s no surprise the importance of unions and voting were topics of their conversation. One common theme amongst the group of centurions is the importance of voting. All four women worked as full-time professionals and have seen many changes over their lifetimes. 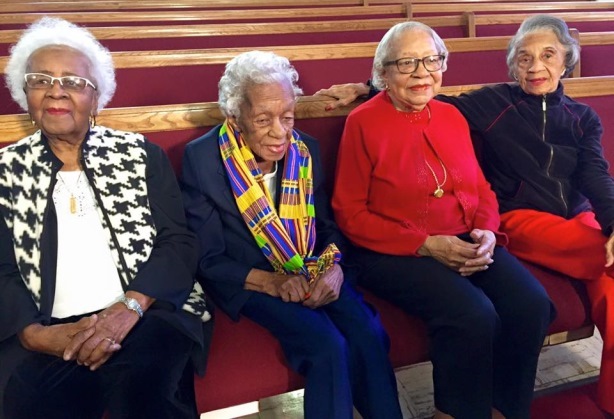 The four friends will celebrate their 100th birthday in June at Zion Baptist Church in Washington, DC.